Excision is one of those cosmetic mechanisms which have proved its work in almost every cosmetic sphere from acne scars to lesions including tattoo removal as well. This process is considered to be as facial plastic surgery. Allergies are also a cause of concern for many people. Hence, excision is a dermatosurgery that is practiced by physicians/dermatologists to eradicate skin impairments like moles, scars, cyst or lesions. The surgeon uses scalpel to help cut the moles from the skin. In fact melanoma is also excised or removed with this kind of surgery. Every dermatologist recommends excision for the lesion removal including other moles. The excision process includes cutting the affected part from the skin so as to give it a lasting and permanent appearance. 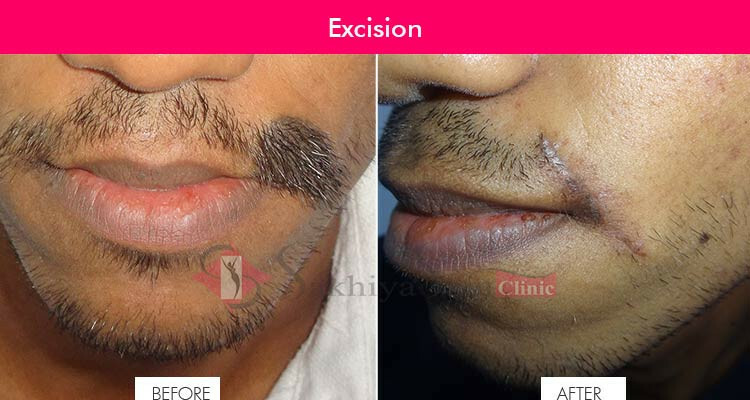 Excision is an invasive procedure as it includes sutures (or more commonly called stitches) but there is minimal scarring during the procedure. LOCAL ANAESTHESIA: In the excision procedure, general anesthesia is not required as only the numbness of the afflicted skin part is needed. TREATMENT: Then the scalpel is used to excise the part from the normal skin. STITCHES: Then the wounds are closed using sutures. This closing of the incision is done just after the excision process And the further opening of these sutures may take 5 – 14 days later. CLEANING: Applying a soothing ointment to soothe the wound, which encourages healing swiftly. The excision procedure has much more efficient results in eliminating unattractive moles, lesions and more. Excision process is used by cosmetic practitioners to remove tattoo permanently, Hence this is said to be magnificent for the same. People looking for such treatment must go for this surgery. This not only repairs the deformity but enhance the facial features more lavishly. • Wound failure But these are the common risks associated hence the surgeon prescribes antibiotics and few lotions and cream to eliminate these problems.